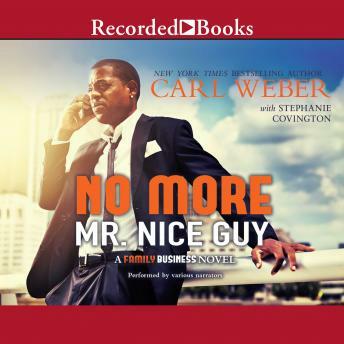 Ripped from the pages of his New York Times bestselling Family Business series, Carl Weber brings you No More Mr. Nice Guy, the origin of Niles Monroe, the super-bad hitman who will one day become Paris Duncan's one true love. Niles has just returned from eight years of serving his country as a Special Forces sniper. He's looking forward to a consulting job with Dynamic Defense and spending time with his family, including his bi-polar mother, Lorna, and his hard-drinking uncle, Willie. What Niles doesn't know is that Dynamic Defense is actually a CIA front. He's not interested in joining them, but they won't take no for an answer. Bridget St. John is one of the most beautiful women Niles has ever met, and she is also the most deadly. It is her job to recruit Niles to the Dynamic Defense team by any means necessary. When Niles is arrested for a murder he does not commit, Bridget makes him an offer he can't refuse: working for Dynamic Defense in exchange for his freedom. With Niles on board, Bridget begins to train him in ways he never imagined. Sometimes, however, the student becomes the teacher. Before she realizes what's happening, Bridget falls in love. When circumstances in his personal life collide with his work, Niles is forced to use his military skills to protect those closest to him. Fans are sure to appreciate this action-packed thriller that delivers love, drama, and suspense with Weber's trademark flair for unexpected twists and turns. These books never fail to entertain and delight. Well done, always.